Hey everyone! Well, so far, this challenge has started off okay. I've only missed a couple...only on my blog hehe! Not so much on my Instagram, where I post mostly, even photos I haven't posted here. Any-who for today's challenge we get to do the color green. Now I can honestly say I had no idea what to do! I'm not a huge green fan...well only emerald since that's my birthstone color. Either way green is not my color! 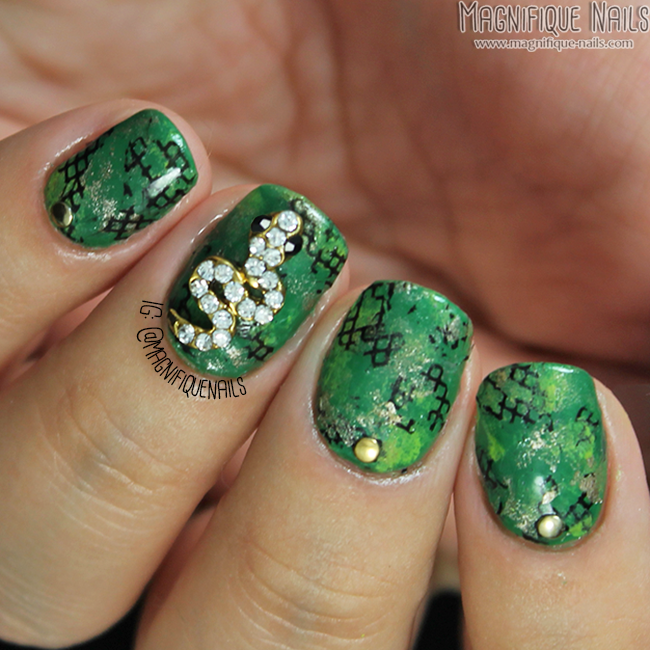 So when I was thinking of a design to do, I almost forgot about the charms I received from Daily Charme (which is one of my favorite nail charm stores), and realized I never done snakeskin nails. Can you believe that?! 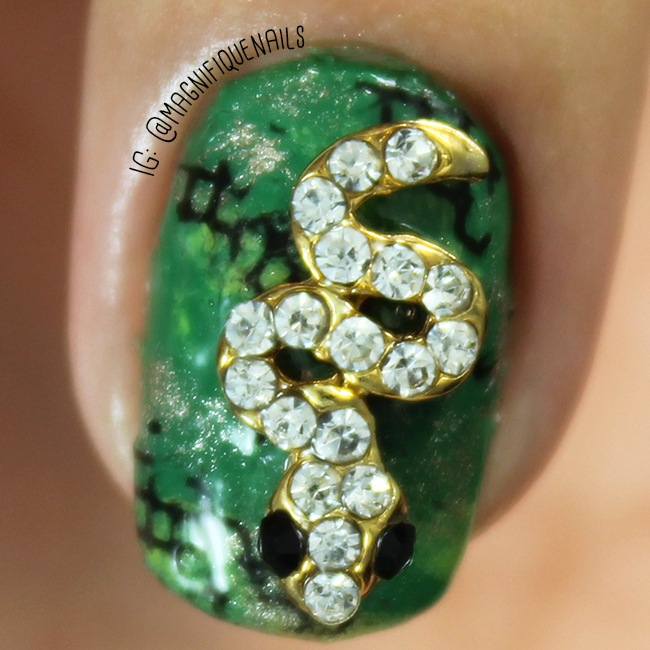 I just love this charm!I guess you can say I was inspired by the snake! :D I even have one in black, which I used for my urban nails (read post here). I just knew it is the perfect fit for this design! 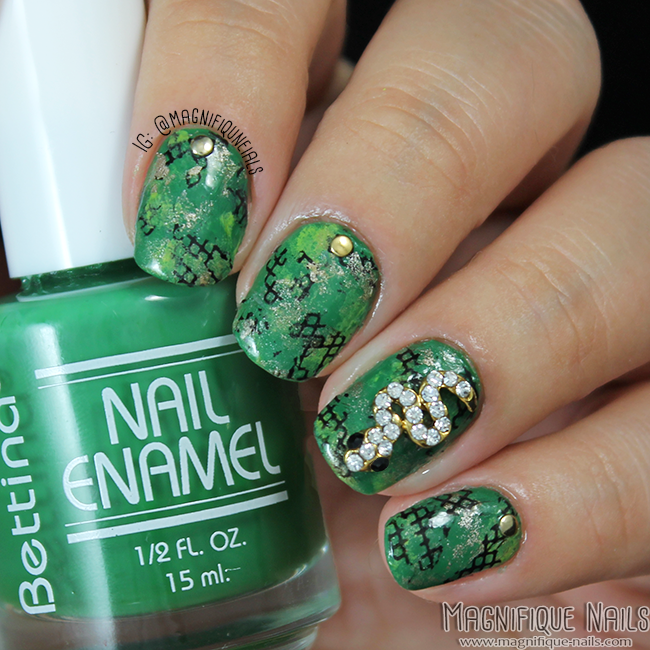 For the base, I began by applying two coats of Bettina Mojito Resort. One the polish was completely dry, using a small piece of a make-up sponge, I dabbed a little of Essie Good as Gold and The More the Merrier. 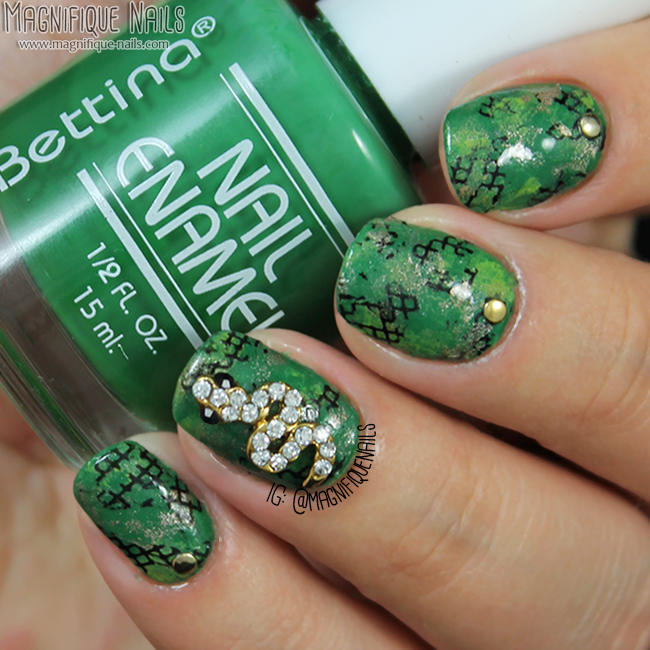 Once that was set, using my stamping plate, I created a small decal with a liner pattern for the scales. For the charm, I applied top coat (for one day wear) and added the charm using tweezers. Lastly, I sealed the design with H K Girl Top Coat, that's it! Overall the colors and the snake charm looks amazing together, and I really loved how it turned it out! You can purchase the charms on Daily Charme website for $2.99!